Jump Rope is NOT only for Boxers! Although commonly associated with boxing and the martial arts, rope-skipping is also recognised by strength and conditioning experts as an invaluable tool for sports such as basketball, track and field, table tennis and fencing. Find out why jump rope is the perfect speed workout here! quickly in any direction before moving back to the start position. Whatever footwork you can perform while jumping rope, you will likely be able to perform the footwork more efficiently without the rope! Proper technique in sports allows the athlete to conserve energy and increase endurance. Concentrating on maintaining the rhythm of swinging the rope while performing different jumps facilitates subtle neuromuscular adjustments, which in turn increases efficiency of movement during games. 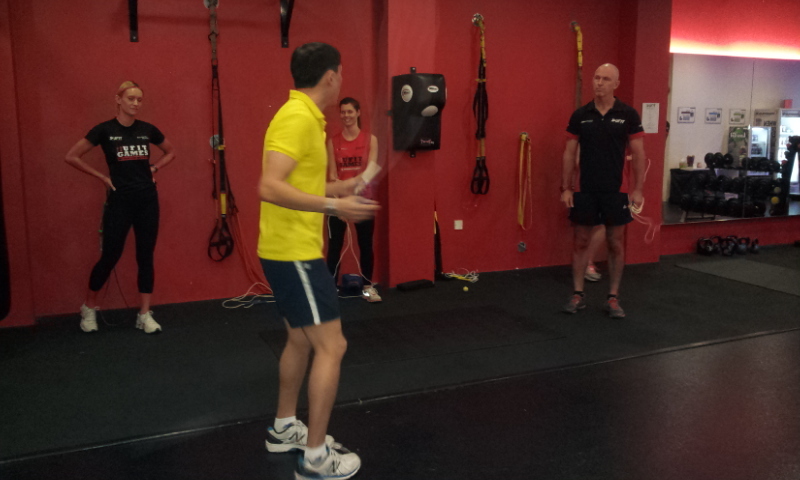 Rope Skipping is especially popular in sports where fast hand and leg co-ordination is essential for success. Examples of such sports includes boxing, fencing, handball and racket sports. Double Unders also reduces the stretch shortening cycles, which directly improves vertical acceleration. Power jumps such as the Frog to Push Up are great maneuvers to help you learn how to activate your trunk muscles/core to react in an explosive manner, which is key for sports such as Track & Field, Judo/ Wrestling and Swimming. Check out the video below for power jumps! Depending on how many percent of your maximum heart rate you train at, rope-skipping is a well known activity to promote both aerobic and anaerobic fitness essential for all sports. -Explanation on how rope-skipping improves sports performance. These sessions will be specially design to the needs of your specific sport. Athletes that have been coached by us include those from Singapore Sports School (Table Tennis, Netball and Swimming), Judo players, Taekwondo players and several S-League Clubs. Prerequisite: Participants should be reasonably fit and be able to perform basic rope-skipping skills. If you would like to find out how to include rope skipping in your sports training, contact hansen@athlete.sg or call 9793 9745 now! For more information about SkipFit, email us at fifi@athlete.sg or call 9069 7326.